If you’re going to be in Nashville between now and June 24, swing by the Tennessee State Museum and see the special bicentennial exhibit Becoming the Volunteer State: Tennessee in the War of 1812. Nashville Scene has an article on the exhibit and Andrew Jackson’s role in the war. 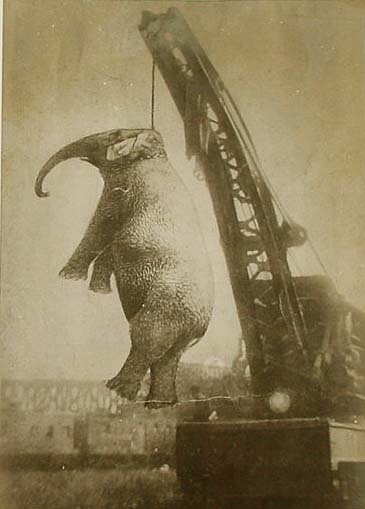 The University of Virginia is about to mount a theatrical production about an East Tennessee hanging that took place in September 1916, which wouldn’t really be all that interesting, except the individual who got hanged was a five-ton circus elephant belonging to Sparks World Famous Shows. The show was traveling through the Southeast that fall when the regular elephant trainer had to leave the tour in St. Paul, VA, forcing the owner to take on an extra hand. On Sept. 10th or 11th, the circus hired a young man named Walter Eldridge, who had been working as a janitor at a local hotel. Just think—one day you’re mopping up after tourists, and the next you’re responsible for a herd of multi-ton animals. Who says there’s no such thing as the American Dream? There was a big ditch at that time, run up through Center Street, …And they’d sent these boys to ride the elephants… There was, oh, I don’t know now, seven or eight elephants… and they went down to water them and on the way back each boy had a little stick-like, that was a spear or a hook in the end of it… And this big old elephant reach over to get her a watermelon rind, about half a watermelon somebody eat and just laid it down there; ‘n he did, the boy give him a jerk. He pulled him away from ’em, and he just blowed real big, and when he did, he took him right around the waist… and throwed him against the side of the drink stand and he just knocked the whole side out of it. I guess it killed him, but when he hit the ground the elephant just walked over and set his foot on his head… and blood and brains and stuff just squirted all over the street. Not exactly the kind of thing you can walk off. In actuality, the circus had five elephants rather than seven or eight, and the elephant that killed Eldridge was a she, not a he. Her name was Mary, and she’d been with the circus for twenty years. That wasn’t enough to get her off the hook for Eldridge’s death. The crowd who saw the whole thing happen started calling for blood, and in any case a rampaging elephant was bad for business, so the circus owner decided that Mary had to be put down. But imposing the death penalty on an elephant is one thing, carrying it out quite another. Guns proved ineffective, and the idea of smashing Mary between two railroad engines seemed a little grotesque, so the circus decided to try hanging. The nearby town of Erwin had a large rail yard, where about 2,500 people turned out to see Mary hoisted by the neck from a derrick. Hoisted twice, actually, since the chain broke on the first attempt. That’s admittedly pretty horrible, but the good news is that somebody had the presence of mind to take a photo. This sordid episode has enjoyed quite a bit of notoriety on the Interwebs, and is also the subject of a short book. If you’re curious about the play, copies of the script are available on Amazon. Believe it or not, this is only one of two plays about this incident; another one premiered in 2009.